We’ve been huge fans of Telltale games around here since the massive shift that was the release of The Walking Dead. The quality of their games continued through The Walking Dead – Season 2, The Wolf Among Us and Tales from the Borderlands which is available on Steam but has yet to hit iOS. The contrast between these recent titles and their previous games like Jurassic Park is just incredible to behold, so it shouldn’t be much of a surprise that Game of Thrones – A Telltale Game Series (Free) falls in line with modern Telltale releases instead of, well, their previous works. If you’re new around here, check out the above links to see how we’ve been reviewing episodic games. We figure it doesn’t make a whole lot of sense to review individual chapters by themselves, nor does it seem like we should wait until the whole game is released to review it. So, we update our reviews, bump it back up to the top of TouchArcade, and potentially change the score as the whole experience changes. This sometimes results in games initially being scored lower, largely because we really don’t know how they’re going to turn out… Which most definitely is the case with Game of Thrones. The problem with the Game of Thrones IP is that the main character of the A Song of Ice and Fire series is the universe itself. HBO may have tricked you in to thinking that it’s about the Starks versus the Lannisters, but nothing could be further from the truth. A Song of Ice and Fire tells the story of the world of Westeros, using the characters that you think the show is actually about. This is how George R. R. Martin can get away with killing loved characters, making seemingly important families irrelevant, and similar- At the end of the day, in the world of Game of Thrones, no one person or house truly matters in telling the story of the A Song of Ice and Fire universe… But readers (and watchers) gravitate towards the popular characters, because that’s the normal thing to do and it seems like that is what Game of Thrones is trying to do. Additionally, as of this writing we’re five massive books and four epic seasons of the show in. The Game of Thrones game takes place along side the events of the book and show. You already know the overarching high and low notes from this, and unless for some crazy reason GRRM allows Telltale to start retconning stuff or they take the alternate universe approach, your interactions with the main characters you know from the show or the books simply must be limited for the rest of the canon to make sense. Especially with through utilizing the voices of the actual actors from the show the whole game has a vibe of something in between potentially interesting fan fiction and blatant fan service, and writing this introduction having only played the first episode, I could really flip a coin on how I feel about that. You do actually play as a house from the books, but the House Forrester is literally mentioned once, on one line, in A Dance With Dragons. That’s it. SPOILER ALERT: Even discussing the setting of the opening scene of Game of Thrones is a pretty massive TV show spoiler as it runs concurrent with one of the biggest events/twists that HBO has aired so far. I highly, highly recommend powering through the show either on HBO Go or just breaking down and buying the DVD’s or BluRays before playing the game, or really, reading any farther. As mentioned, George R. R. Martin is notorious for just killing off characters when you least expect it, and the impact of those events will be significantly lessened if you know they’re coming. No joke, the “What the F*#&!" GRRM is capable of producing is just amazing to behold. The game opens with the player in to proverbial pilot seat of Gared Tuttle, a member of House Forrester and the squire to the lord of said house, Gregor Forrester. You’re loyal to Winterfell, and it just so happens you and Lord Forrester have found yourselves in the camp outside of The Twins just as the Red Wedding is about to go down. Playing as Gared, you have more than a few conversations where the game susses out what kind of person you are and just how much you value honor and other Game of Thrones-y things. It doesn’t take long for the s*#& to hit the proverbial fan, leaving you making quick decisions and ultimately running for your life as the soldiers begin to slay the unsuspecting northern army. As expected in the world of Game of Thrones, seemingly main characters in the game start dropping like flies, and your next major choice is whether or not you’re going to keep a secret when you run back to the castle of Ironrath, which is the home base of House Forrester and the setting for the next segment of the episode. Oh, but of course you don’t get there until you run into some other events and notorious recognizable characters from the Game of Thrones universe. You hear some things which become incredibly relevant in the future, and it wouldn’t be a Telltale game if it weren’t up to you to decide how to present that information when you return home. I’m not sure there’s a way to argue your points in a way that doesn’t get you sent to the wall, as it wouldn’t surprise me if there weren’t some pretty major events that transpire there which Telltale needs a character there to tell them through. Following all that, you switch between two other members of House Forrester: Ethan Forrester at Ironrath and Mora Forrester who conveniently is a handmaiden to Margaery Tyrell in King’s Landing. Ethan’s story seems to be the most compelling of the first episode, as he is young and unready to inherit the position of Lord of House Forrester. You’re quickly thrown in to the mix with some really difficult decisions on how you’re going to guide your house, filled with advisers who may or may not be representing your best interests. Meanwhile, Mira spends a lot of time talking to Margaery Tyrell with the highlight of that particular segment being an in-depth conversation with Cersei and Tyron Lannister inside of the throne room. This feels particularly cool, since, as mentioned, the actual actors from the show are doing the voices which adds a really great element of immersion which I wasn’t entirely expecting. Like seemingly every Telltale game, the first episode ends with a bang. I’m not going to spoil it, but they’re definitely following a formula here which is starting to get a little too predictable. But, hey, if you look at the first episodes of these games as being the essential equivalent of a TV show pilot, of course they have to end with something crazy to keep you coming back. 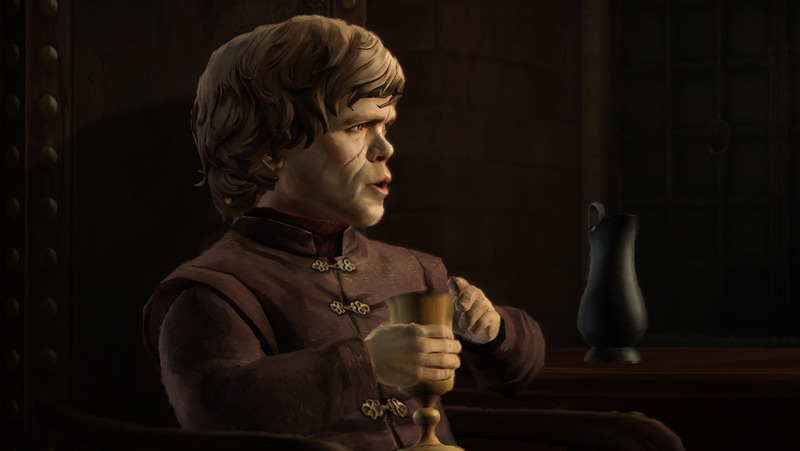 I don’t mean to be overly harsh on Game of Thrones, as I truly want to give Telltale the benefit of the doubt on where they’re taking this game series- There’s lots of potential here. However, since I’m only able to judge it on what is presented in the first season, three stars seems like an appropriate rating for the game so far. The episode does a lot of work in introducing the impressively massive cast of characters, and because of that it really feels like a trip through a Game of Thrones themed Disney ride. You see a lot of events, people and places you’re familiar with. When Gared got sent to the wall it felt less like any kind of actual punishment and more like an eye-rolly “Well of course he has to go to the wall, how else will this train stop there?" I assume there’s going to be an appropriate payoff for all the things introduced, but it’s hard to say just yet. We’re at a serious crossroads here in that it’s entirely possible that the next episode is going to continue the guided tour of your favorite places of Westeros in the most fan service-y way possible… Or we could divert off into some super-dark plot points with some substantial payoffs for what has seemed like fluff so far. The worst part now is the waiting.